Let’s start with the bottom line – you’ll never get in trouble even if you don’t know or follow Japanese eating customs and table manners. Never. I promise. More likely, Japanese people will be happy to teach you how certain things are eaten. I’ve met a few people who tend to go back to their comfort zone of burger shops or sushi trains, because they are worried about Japanese table manners. This is a real shame, given the fact that millions of tourists come to Japan specifically because they love Japanese traditional food. Truth be told – even Japanese people don’t know a lot about traditional manners. So, what are your chances? 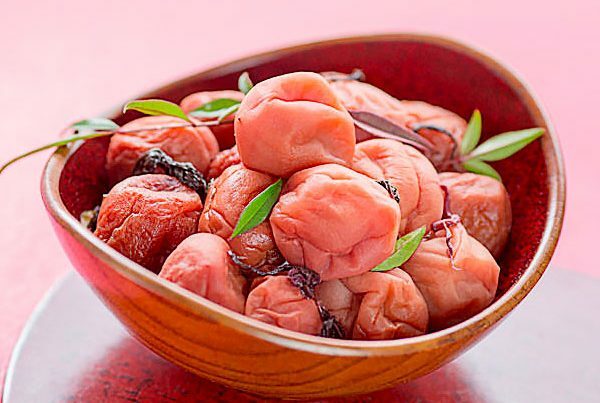 Forget perfecting Japanese table manners and try as many varieties of cuisine as you can. Having said that, it won’t hurt to know a little bit about how to eat what and where before you arrive in Japan. Below we’ve picked three most popular types of restaurants – ramen, izakaya and sushi – and listed some of the most important Japanese eating customs and Japanese table manners you should know before going to Japan. Oh yes, the most popular B-level Japanese traditional food, with a cult following around the world. Many of you have probably already tried ramen in your country, so you know that it’s a very relaxing place to eat as far as Japanese table manners are concerned. So only a few things that need to be kept in mind when eating ramen in Japan. Look at the menu outside, decide what to eat and order as quickly as possible. Nowadays, many ramen-ya have a ticketing machine at the entrance. Decide first before you start putting money into the machine so as not to frustrate people waiting behind you. Once you get a ticket, simply pass it to a waiting person and wait for your ramen to arrive. Once you get your ramen, cut down on talking and eat at a steady pace. 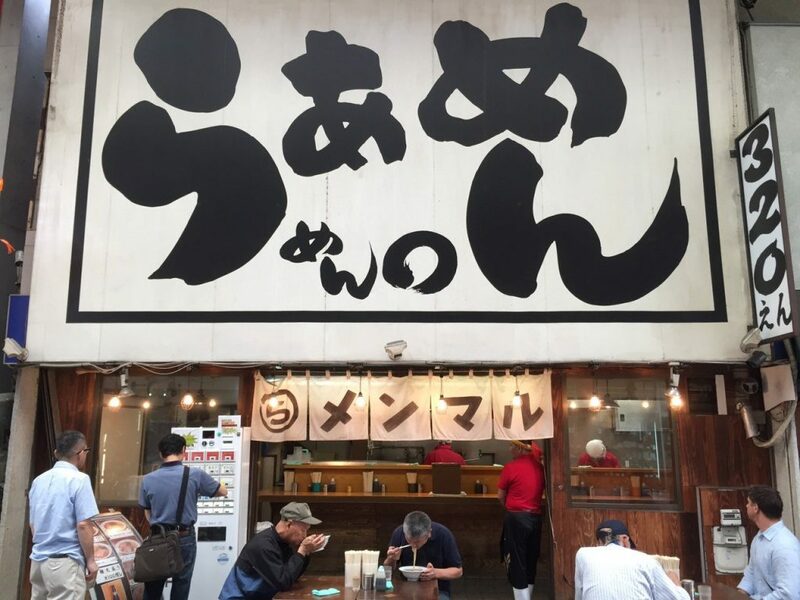 Unlike more proper restaurants, you are expected to eat quickly at ramen restaurants and leave as soon as you are done. You certainly shouldn’t have a party with friends there even if you are going to drink alcohol, unless it’s Chinese restaurants (or often called “chuka”) offering ramen. Never frown on the slurping noise coming from the person next to you. In Japan, it is a traditional custom and a good manner to slurp when eating noodles. Try to eat ramen with chopsticks, but if you are uncomfortable with them, ask for a fork. That’s perfectly okay. 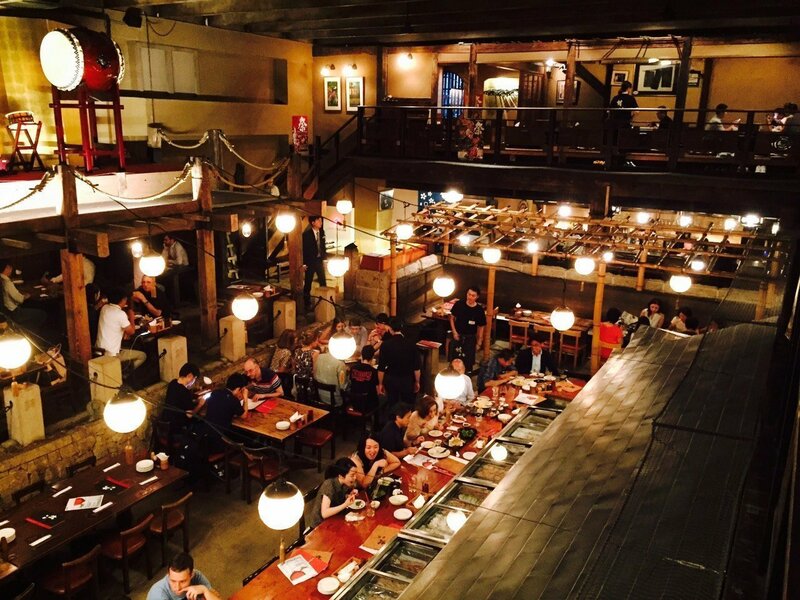 You don’t have to worry about Japanese table manners so much at izakaya or Japanese pubs. You will have your own table and no one will be watching you eat. But if you are going to eat with Japanese people, you should and shouldn’t do the following. You should hold your drink until everyone has one and “kanpai! (lit. ‘cheers’)” is declared in unison. It’s a bad manner to pour your drink by yourself – try to wait till someone notices that your glass is empty. At the same time, you should watch other people’s glass and offer pouring if theirs are empty. Your Japanese friends will do ordering food, but be honest with what you can’t or don’t want to eat. But try not to make face at dishes even if they look slightly gross or weird. More importantly, here is a number of things you should know about how to and how not to use chopsticks. Do not pass food from your chopsticks to another person’s chopsticks (this is done with bones of the deceased at cremation ceremonies). If someone offers you food, just use a plate or a bowl to receive it. If you are uncomfortable with chopsticks, again, just ask for a spoon or fork. It’s not worth sweating over. In Japan, seating arrangement is crucial. Important people sit in kamiza or the ‘top seat’, meaning the place of honor. It is usually the seat furthest from the door. It is the warmest and safest seat and this seating culture developed in the feudal period. Opposite to kamiza is shimoza. 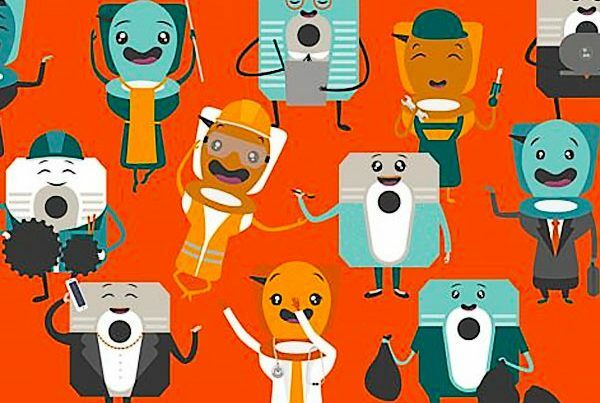 If you are with Japanese friends or business partners, it’s safe to wait till your friends suggest a seat – it all depends on the hierarchy of status among attendants. 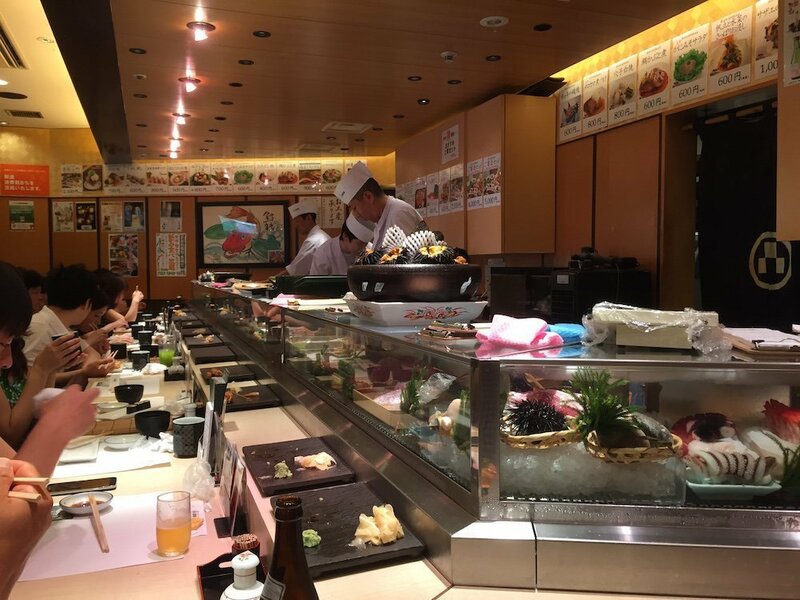 With sushi being one of the most traditional cuisine in Japan, there are many rules and etiquette on how to eat at sushi restaurants or simply called sushi-ya. We only cover Japanese table manners at regular, traditional sushi-ya, as many people probably know how to eat at sushi trains (pick up plates and eat). Only basics are covered below, but remember, most important thing is to enjoy the food. Chopsticks or hands: Should you eat sushi with chopsticks or hands? Both are fine and it’s up to you. The most important thing is you eat “beautifully”. The worst thing is to let sushi rice fall apart, making a mess in your soy sauce plate. If you are comfortable with chopsticks, use them, and if not, use hands. But use chopsticks at all time when you eat sashimi and other non-sushi dishes. Wasabi mix: In contemporary Japan, many people don’t hesitate to mix wasabi with soy sauce quite thoroughly. But the most traditional and respected way is to place a small amount of it on a plate and slightly mix it. 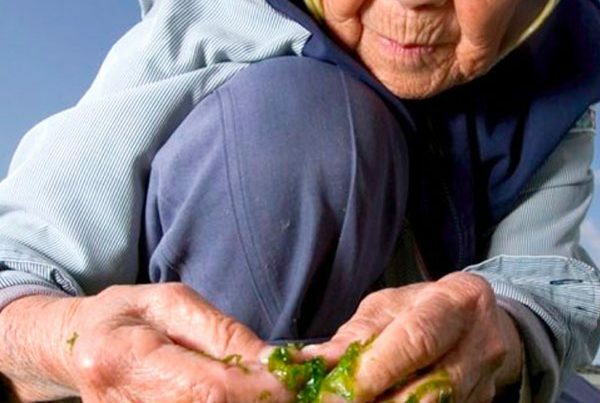 Greenish soy sauce is still a turn-off for discerning sushi lovers. Dipping: The most traditional way is to pick up a piece of sushi, turn it around and dip the neta (e.g. fish, shellfish, vegetables or any other things on top of rice) part into soy sauce. If you let the rice part touch soy sauce, it tends to fall apart and crumble, making a mess on the plate, or worse, the table. This has to be avoided at all cost. Tabehodai all you can eat sushi: There are quite a lot of all you can eat sushi restaurants in Japan today. Here is the list of 5 best sushi restaurants that offer the tabehodai deal. Make sure you order your sushi as you go along – if you have an excessive leftover at your table, it’s not only a bad manner but you could be fined. This is one of most important Japanese eating customs. Sushi chefs and clerks use sushi lingo. Some famous ones are ‘agari‘ for green tea, ‘murasaki‘ for soy sauce, and ‘oaiso‘ for the bill. You are not expected to use their lingo, and on the contrary, it’s considered as a bad manner to do so. Yes, it exists. Quite a lot. You can walk into a sushi restaurant and find no menu or price in sight. They are not evil restaurants trying to rip you off, but more likely they are classic, high end sushi restaurants, of which most Japanese could only dream. In Japan, business people frequently do ‘settai‘, i.e. entertaining their customers, guests and business partners at various venues, and sushi restaurants are often used as a settai venue. High end restaurants with Japanese traditional food do not show prices so that the person who is being entertained do not have to know how much the bill is going to be for the person doing the settai and picking up the bill. If you happen to walk into such a restaurant, don’t panic. It is perfectly okay to walk out. If you really want to try high quality sushi but are worried about the bill, then, you can tell them your budget. Ask them to make sushi for you up to, say, 5,000 yen or more. It’s also a cool thing to do to just ask the chef to make sushi with the best ingredients they’ve got for that day. One custom that is common at all types of restaurants in Japan is no tipping. Restaurants will simply refuse to take any tips from you. Okay, that’s all for today, but we will write follow-ups on Japanese eating customs, Japanese table manners and Japanese traditional food in the future. If there is any particular cuisine or restaurant you’d like to know, let us know and we’d be happy to provide more information.